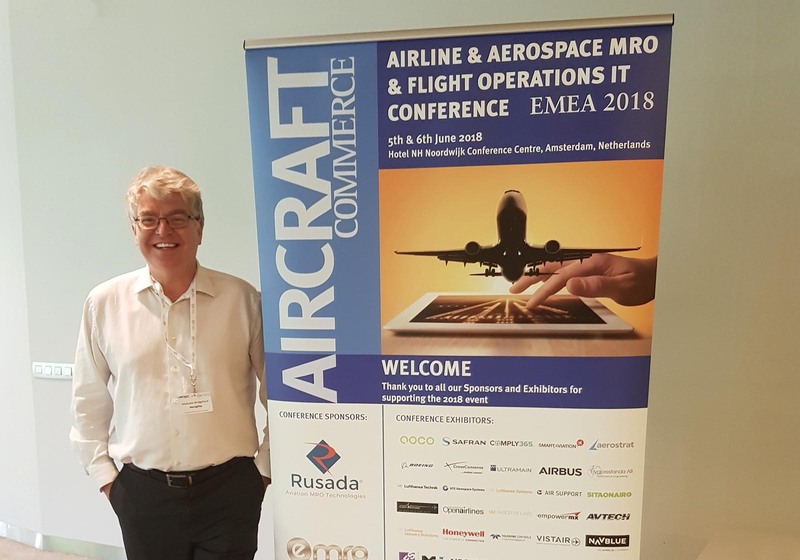 The Aerogility team attended Aircraft Commerce’s Airline & Aerospace MRO & Flight Operations IT Conference in Amsterdam last week, the industry leading event addressing how IT is used for aircraft maintenance and flight operations. The team attended insightful talks given by speakers such as Michael Denis, principal and industry executive, Capgemini, who spoke about digital aviation innovation and disruption in the MRO industry, and Sander de Bree, CEO, EXSYN, who addressed changes to EASA regulations and the impact on software and technology in flight operations and MRO. Albert Almendro, aircraft structures engineer, Vueling, discussed how robotic process automation, an upcoming technology that allows software robots to mimic the actions that human users of MRO software would regularly perform, is used on a daily basis in Vueling’s CAMO department. Malcolm Bridgeford, customer solutions director, Aerogility, says, “The MRO & Flight Operations IT Conference gave us the opportunity to pick up on some key trends in the MRO industry. Firstly, we noticed that long-range planning is becoming more pertinent for operators and airlines, as they optimise their planning and maintenance over a longer period of time. Secondly, we are seeing more data than ever being produced on the aircraft, however, the industry is now presented with the challenge of converting this data to make workable solutions. Lastly, the conference reiterated to us that the next steps for MRO management are to connect the whole aircraft operations process and become completely digital and paperless.